Michael E. Mann is an atmospheric science professor at Penn State University, a climate catastrophe advocate, and a militant campaigner against scientists who disagree with him. He is most famous as the creator of the discredited and controversial “hockey stick graph,” which has been discredited by statisticians for distorting past climate history and offering outlandish predictions of future carbon-dioxide-induced global warming. Mann is the author of the books Dire predictions: understanding global warming (2008) and The Hockey Stick and the Climate Wars: Dispatches from the Front Lines (2012), which have been described as self-aggrandizing scare tomes. He is a member of the Council of Advisers of the Climate Accountability Institute, which held the Planning Workshop that guided the state attorneys general “AGs United for Clean Power” to prosecute climate skeptics. Mann is also a direct collaborator with the RICO20 professors, who along with U.S. Sen. Sheldon Whitehouse (D-RI), have called for prosecution of all climate skeptics. Mann’s arrogant, intolerant and vengeful attitudes — as reflected in his writings and even his Twitter feed — have caused even colleagues to be wary of him, and spurred the targets of his attacks to redouble their efforts. In a June 2016 speech, Mann tried to convince the Democratic Party Platform drafting committee that Democrats must act urgently to enforce his alarmist agenda before the “right wing denial machine” distorts his message. Mann was born in 1965 and brought up in Amherst, Massachusetts, where his father was a professor of mathematics at the University of Massachusetts. At school he showed early interest in math, science, and computing. When he reached college age, Mann selected the University of California, Berkeley, where he took a double major, graduating with honors in 1989 with an A.B. in applied mathematics and physics. Mann then attended Yale University, intending to obtain a PhD in physics, and received both an MS and an MPhil in physics in 1991. While still finishing his PhD research, Mann met University of Massachusetts climate science professor Raymond S. Bradley and began research in collaboration with him and seismologist Jeffrey Park, which was to lead him to the Hockey Stick and public notice. Mann was granted his PhD in geology and geophysics from Yale in 1998. Mann’s many research grants, publications, invited lectures, and other experiences are completely listed in his curriculum vitae. Mann’s highly detailed 79 page Curriculum Vitae is posted here. Mann’s Penn State salary and benefits are over $200,000 annually with his income fattened by speeches he gives for up to $10,000 according to reports, but he has not attracted a benefactor to support an Endowed Chair, unlike peers such as former Environmental Defense Fund climate scientist Michael Oppenheimer, who holds a multi-million-dollar endowed professorship at Princeton University. The NSF research grant was specifically biased to only seek evidence for man-made climate change — rather than investigate whether or how much mankind had caused climate change. The one-sided research purported to find a historical record beginning with low atmospheric temperatures in 1000 AD, and ending with a sudden increase in recent times to allegedly “unprecedented” levels. The blame went to human greenhouse gas emissions, reinforcing the already roiling dispute about man-made global warming. By 2001 Mann had cemented his alarmist reputation as lead author of the chapter on Observed Climate Variability and Change in the Third Scientific Assessment Report of the United Nations’ Intergovernmental Panel on Climate Change (IPCC). The IPCC Report used his “hockey stick graph” as its logo and it became a symbol of the emerging controversy between climate change skeptics and believers. Mann’s Hockey Stick research was questioned by statistical analyst Steve McIntyre and environmental economist Ross McKitrick for minimizing or removing the Medieval Warm Period and the Little Ice Age from the historical record, among other peculiar data treatments. The challenge prompted wide publicity and a US congressional inquiry and report debunking Mann’s findings. In defense, Mann and several alarmist colleagues created their own vanity website, Real Climate, to attack their critics. This scientific confrontation brought Mann more government grants to find human causes for climate change, placing him in the spotlight of the developing debate on Anthropogenic Global Warming (AGW). His growing prominence gained him colleagues in the United Kingdom’s Climate Research Unit (CRU) at the University of East Anglia, and elevated him into something of a celebrity with a notoriously short temper with intolerance for differing opinions. Critiques of Mann’s work began to appear in peer reviewed journals, which prompted him to lead all-out attacks against not only the critical scientists, but also the journals, their peer panels and their editors to silence disagreement and eradicate disagreement with his preferred public policy. Tactics included gaining control of science journals and libel lawsuits against scientific critics. Mann and colleagues from the IPCC science team became the featured players in the 2009 “ClimateGate” scandal over leaked emails that revealed their cunning tactics to destroy the careers and publications of perceived opponents. Mann’s Hockey Stick research was investigated by Penn State University, for which Mann was a valuable cash cow in federal grants, and by the National Science Foundation, which could count on Mann for politically correct research results. He was found to have done no technical wrong, beyond using sloppy word choices. These investigators turned a blind eye to his role in collaborating to damage or destroy skeptic publications and scientists, but the British government investigators found faults they deemed serious, including information that may have been deleted to avoid disclosure. As of July 2014, Mann appears as a member of the Board of Advisors of the Climate Accountability Institute (CAI) on the organization’s website. His affiliation connects him directly with the organized efforts to prosecute climate skeptics via RICO statutes, which got its start with Naomi Oreskes, co-founder of CAI. RICO, the Racketeering Influenced and Corrupt Organization, is a law designed to battle organized crime, but was later used in civil cases, particularly against tobacco companies that were subject to billion-dollar lawsuits to compensate for the health problems of their customers. Oreskes conflated tobacco with fossil fuels, seeking to enforce penalties sufficient to destroy the fossil fuel industry through prosecution of both producers and advocates, particularly climate skeptics. Mann’s affiliation with this effort indicates his dedication to prosecute “deniers.” (The environmental left has chosen this term specifically to equate those skeptical of catastrophic man-caused global warming to Holocaust deniers. Mann refuses to use the term “skeptic.” ) Mann’s allegiance to prosecution for skeptics is symbolized by his advisory status with the CAI, and his close ties to its allied group, the Union of Concerned Scientists. The RICO20 refers to 20 scientists — including professors from nine universities and scientists from two institutes — who signed a letter known as the RICO 20 letter, sent to the U.S. Attorney General and the President of the United States on September 1, 2015. It called for a federal criminal investigation into possible “racketeering” and collaboration among entities questioning the science backing the hypotheses of human-caused, catastrophic climate change. The Climategate scandal erupted on November 19, 2009, when a collection of email messages, data files and data processing programs were leaked from the Climatic Research Unit (CRU) at the University of East Anglia in the United Kingdom. The emails revealed scientific fraud and data manipulation by scientists bent on maintaining belief in the hypothesis of catastrophic man-caused global warming despite data revealing its flaws. Mike Mann leapt from relative obscurity to international fame with his “hockey stick”, a graph of global temperatures from 1000 AD to the present, which was the showpiece at the launching of the 2001 IPCC Third Assessment Report in Shanghai in January 2001. The hockey stick became a corporate logo for the IPCC, but because it rubbed out the Mediaeval Warm Period and the Little Ice Age from the historical record, it was subjected to a US congressional inquiry. Eventually it was shown that random data fed into the algorithms used by Mann to produce his hockey stick from bristle cone pine tree ring data, also yielded hockey stick results. Mann defends himself by saying Penn State looked into the e-mails and decided that he had not suppressed data at any time. However, an inquiry conducted by the British parliament came to a different conclusion. “The leaked e-mails appear to show a culture of non-disclosure at CRU and instances where information may have been deleted to avoid disclosure,” the House of Commons’ Science and Technology Committee announced in its findings. Michael Mann: lead player in the United States. Phil Jones: lead player in the United Kingdom. Keith Briffa: older player whose blunders lead the others to all but abandon him. Tom Wigley: older player who becomes increasingly worried about the unfolding scandal. Ben Santer: dangerously arrogant and naive young player in the United States. In this next very long email, nearly halfway through several messages and replies, Keith Briffa raises one of the issues that is central to the infamous “hide the decline” email. “Keith Briffa responding to Mike Mann, Phil Jones, Tom Karl, and Chris Folland: I know there is pressure to present a nice tidy story as regards ‘apparent unprecedented warming in a thousand years or more in the temperature proxy data’ but in reality the situation is not quite so simple. We don’t have a lot of temperature proxies that come right up to today and those that do (at least a significant number of tree proxies) have some unexpected changes in response that do not match the recent warming. I do not think it wise that this issue be ignored in the chapter. I believe that the recent warmth was probably matched about 1000 years ago.” The issue is so complex that those interested in a more thorough account of all the methods used to “hide the decline” should refer to Steve McIntyre’s extensive discussion. Six UK agencies commissioned a handbook of sophisticated public behavior change tactics for public relations tone-deaf scientists. Its title: “The Rules of the Game: Evidence base for the Climate Change Communications Strategy.” It is horrifying Orwell-like non-fiction backed by Big Money from The Carbon Trust. It has to be read to be believed. It is posted here. Discrediting and sabotaging peer reviewed journals for publishing skeptic papers. “Michael Mann: The Soon and Baliunas paper couldn’t have cleared a “legitimate” peer review process anywhere. That leaves only one possibility—that the peer-review process at Climate Research has been hijacked by a few skeptics on the editorial board. And it isn’t just De Freitas; unfortunately, I think this group also includes a member of my own department… The skeptics appear to have staged a “coup” at Climate Research (it was a mediocre journal to begin with, but now it’s a mediocre journal with a definite “purpose”). 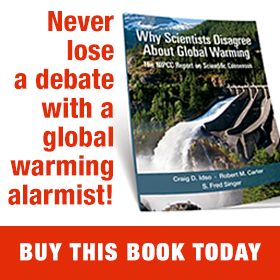 While he has waited, Steyn wrote a book titled A Disgrace to the Profession, which is largely comprised of quotes from scientists around the world who have criticized Mann’s hockey stick graph and the effect of alarmism on the field of climate science. Steyn and his attorneys consider this an important First Amendment case, protecting the right of citizens to criticize climate alarmists and their scientific claims — especially if they work at public institutions.